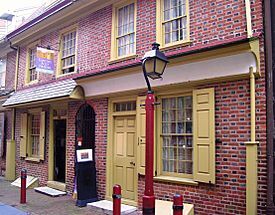 Elfreth's Alley is a street in Philadelphia which is referred to as "Our nation's oldest residential street," dating to 1702. As of 2012, there are 32 houses on the street, which were built between 1728 and 1836. The Elfreth's Alley Museum is located at #124 and 126. The alley is a National Historic Landmark. Located in the Old City neighborhood, it is between North 2nd Street and North Front Street, in the block between Arch and Race Streets. Elfreth's Alley is named for Jeremiah Elfreth, an 18th-century blacksmith and property owner. Among the alley's residents were tradesmen and their families, including shipwrights, silver and pewter smiths, glassblowers, and furniture builders. In the 1770s, one-third of the households were headed by women. 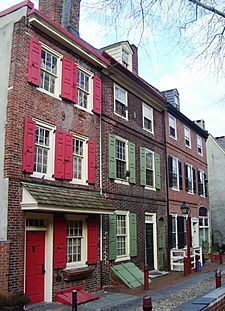 The Georgian and Federal-style houses and cobblestone pavement of the alley were common in Philadelphia during this time. In the late 19th and early 20th centuries, industry began to change the street. Perhaps the first was a stove factory that in 1868 took its place in a row of residential houses. Eventually, factories surrounded Elfreth's Alley. The city's waterfront was only a few blocks away. Industry changed more than the architecture; successive waves of immigrants, lured by the nearby jobs, moved onto the street; in 1900, the neighborhood was overwhelmingly Irish. In 1934, the Elfreth's Alley Association (EAA) was founded to preserve the alley's historic structures while interpreting the street's 300-year history. The EAA helped save the street from demolition, and also lobbied the city to restore the alley's name to "Elfreth's Alley"; it had been designated as the 100 block of Cherry Street years before as part of a street-name simplification program. Present-day Elfreth's Alley is the product of cycles of urban renewal and decay as well as historic preservation efforts. The alley is a tourist attraction and a rare surviving example of 18th-century working-class housing stock. The site stands in sharp contrast to the more frequently preserved grand mansion houses of Philadelphia's Society Hill neighborhood. Elfreth’s Alley Museum, located in 124-126 Elfreth's Alley, preserves the 18th-century home of a pair of dress-makers. Restored to a Colonial-era appearance, exhibits in the house and tour guides interpret the life of the house and alley's residents in that era. Guides also discuss other houses on the alley and their inhabitants. The Elfreth's Alley Association holds several holiday celebrations each year, whose proceeds support the upkeep and restoration of older homes. For more than 70 years, Elfreth's Alley has celebrated "Fête Day" in early June, which celebrates the Alley's diverse ethnic heritage. Residents open their private homes to the public, and are accompanied by historical reenactments and festivities. The Brandywine Heights High School Band and their Fife and Drum Corps perform 18th-century fife tunes as they parade through the alley. For about 10 years, Elfreth's Alley has held "Deck the Alley," an annual self-guided tour of 13 private homes festooned with Christmas and holiday decorations, and also includes caroling. The Alley also hosts events for Fourth of July, Oktoberfest and Halloween. Elfreth's Alley Facts for Kids. Kiddle Encyclopedia.